An historic shipyard is to be brought back to life as a vibrant riverside community after plans were approved. Plans have been drawn up to build 34 new homes at Smith’s Dock, in North Shields, as part of a larger scheme to bring the area into the 21st century. Ambitious proposals have been drawn up as part of a joint venture between Places for People and Urban Splash which will eventually see 815 new homes built. Centred around three retained dock basins, the scheme will also create workspaces, cafes and bars, as well as open up new connections along the river between the Fish Quay and Royal Quays, and from the town centre down to the waterfront. The first phase of the scheme will see ten three-bedroom houses next to Lawson Street and 24 four-bedroom homes designed in a crescent shape, as well as 104 parking spaces and a green space referred to as the ‘orchard’. And the application was approved by members of North Tyneside Council’s planning committee on Tuesday. After the meeting, Mary Parsons, group directory placemaking and regeneration at Places for People, said: “This is great news for North Shields and for the region. “Places for People has been working to build a new future for Smith’s Dock since 2006. “We have invested in this fantastic site which will create a new community with new homes and places to work and visit. 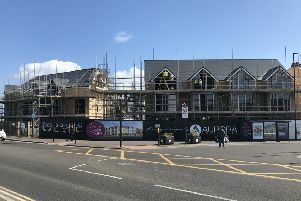 Tom Bloxham, Urban Splash chairman and co-founder, added: “This is Urban Splash’s first development in Tyneside and what a site. “We have a proud track record of transforming neighbourhoods and we’re looking forward to working with our partners Places for People to help turn this historic shipyard once again into a busy, lively place. Mayor Norma Redfearn said: “This is a great day for the rebirth of Smith’s Dock.